It seems like each year summer comes and goes faster and faster! As it's coming to an abrupt end for me, I've had classroom community building on my mind. I wanted to share some ideas I have used, many since I first began teaching, that have helped me to build a positive learning environment from the start. My mother was also a teacher, and she started the tradition I have done on the first day of school for the past twenty years. When the students come into the classroom for the first time, I have a poster greeting them at the door that says, "Welcome to the Greatest School Year Ever!" They walk in and see balloons around the room and goodie bags on their desks, and they immediately feel excited about their new classroom. This helps to build excitement for the new school year and helps to alleviate anxiety they may be feeling. Basically, we have a party to celebrate the new school year. We celebrate the end of the school year with parties, but what about the beginning? A new school year is definitely something to celebrate! I read the silly story This School Year Will be the Best! Below are the goodie bags I will have sitting on their desks when they arrive. 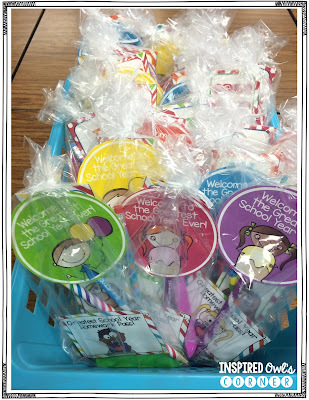 These bags include a bookmark, Pixy Stix with a welcome printable attached, pencil, eraser, and a homework pass. I sometimes add granola bars to the bags, but this year I will pass them out separately. I have these items included in my pack, The Greatest School Year Ever, which is filled with some fun back to school projects, activities, and printables to throw your own Greatest School Year Ever party! Every year I let the students choose where they want to sit on the first day of school. I don't put name tags on their desks for about a week and a half after school starts so I can observe my students' interactions with each other. This also helps them to feel more secure, since they can sit next to their friends. It lets me quickly see who is able to work with who. After this time period, I ask them to write the names of four other students who they think they can work well with, and I promise them that I will do my best to choose at least one of those students to be in their group. After a few of the typical getting-to-know-each other activities and a tour of the campus, I bring the students back to their seats and ask them to think of the perfect classroom. I say, "Everyone, please close your eyes. I want you to visualize the perfect classroom. What kinds of things would you hear other people saying in a perfect classroom? What would you see happening in a perfect classroom?" 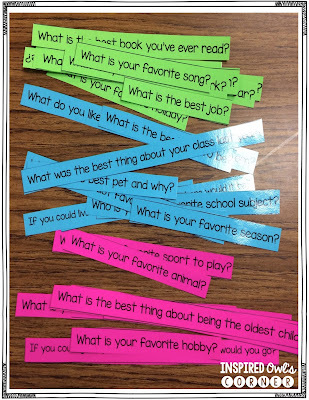 I have them think about these questions for a minute, then I ask them to work in pairs to discuss their thoughts. Next, I have pairs form into groups of 4-5. Each group is given a poster board, and they write down the statements everyone in their group makes. I walk around the room and observe and refrain from commenting on their discussions. After students are finished brainstorming, we post the charts and discuss them. They usually talk about hearing only positive comments being made, no put-downs, students working nicely together, sharing, etc. Everyone comes to the agreement that we would all like to have the perfect classroom, and in order to achieve that it would involve everyone working hard to create the positive environment we've imagined. I leave the posters up to refer to as I'm teaching the first few weeks of school. Have you ever had your students create the classroom rules? You have to save your pretty rules posters for the second day of school if you do this! Students really buy into following the rules because they helped create them. I have students work in groups and come up with the rules they think are important to have in a classroom. After everyone brainstorms and records their ideas, we discuss them as a class. I tell them I will take their ideas and compile them into the classroom rules. Surprisingly, the rules they come up with fit into the rules I have already established. It's always fun to form collaborative groups using candy or some other non-traditional way of grouping at the beginning of the year. Depending on how many groups I want to make, I buy that many different types of candy, and one for each student. For example, if I want to form groups of four, and I have 28 students, I will buy 7 different types of candy. I have students choose one candy from a bag without looking, since I want them to form connections with other classmates, not just their friends who might choose the same candy. Then I say, "Apple Jolly Ranchers, meet at table group 1. Strawberry Starburst, meet at table group 2, and so on, until all of the groups are at their tables. 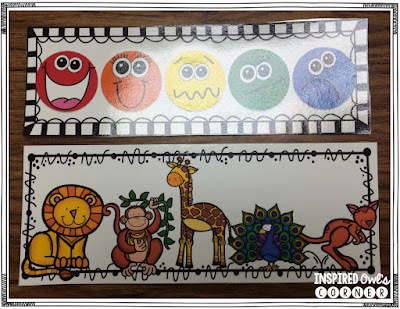 Another idea for grouping is to have a picture or sticker of one animal for each group you are making, place them in a bag, and have students get into flexible groups that way. I have found that students love variety and novelty! Students need opportunities to build a sense of community with their classmates. Every morning I have my students sit in a sharing circle. Sometimes I have a simple question for them to answer, and other times I have them pull a strip of paper with a question on it, as shown in the picture below. This next one is a really fun too. Have students use the top card shown in the picture below to share how they are feeling and why. For example, I might say, "I feel like the red smiley face because I'm so excited to be here with all of you." The students are able to interpret the colors and faces however they like. The animal card on the bottom is a similar idea, but the students share which animal they feel like and why. Again, I accept all answers they give. Sometimes students don't want to share, and that's fine, since they can just pass. After everyone has a chance to share, I ask if there is anyone who didn't get a chance to share, and would like to, and they can share at that time. What I love about doing sharing circle every morning is that I can get a quick glimpse of how my students are feeling. If one student is having a bad morning, I can give him/her a little extra attention throughout the day. You can use any question to get them sharing- what is your favorite move, song, book, food, etc. The prompts are endless! The books below are my go-to books for everything Bucket Fillers! I use all three of these at the beginning of the year. 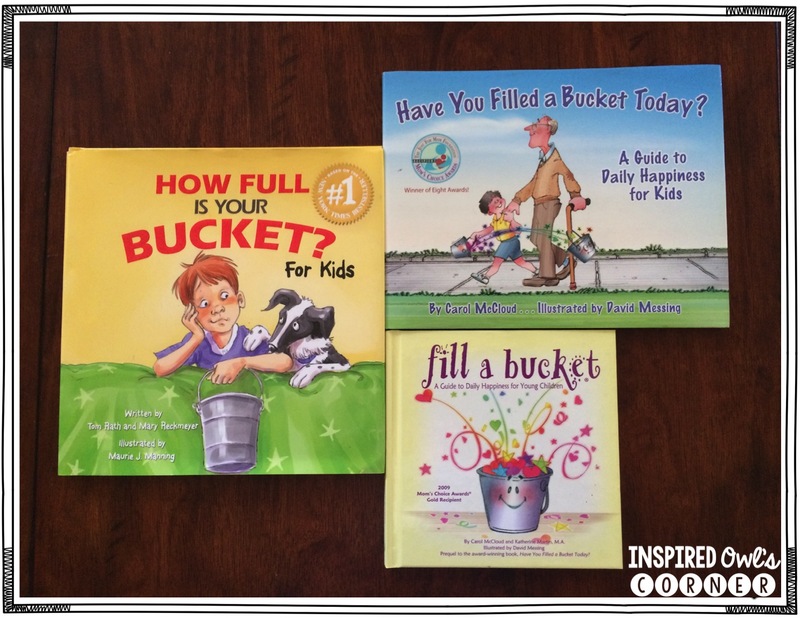 They explain the ideas behind the bucket filling and bucket dipping. 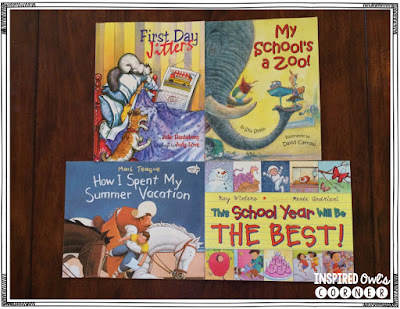 The books below are my tried and true first day/week of school books! The last set of books below are some of my very favorites! They are wonderful for teaching about kindness, tolerance, and friendship. I love to read Cookies to them while I introduce my Character Kiddos and Critters posters. This book also requires students to infer, so I do an introduction to inferences. After I read the book and discuss what having good character means, I pass out chocolate chip cookies. The kids love it! The other books are equally wonderful. 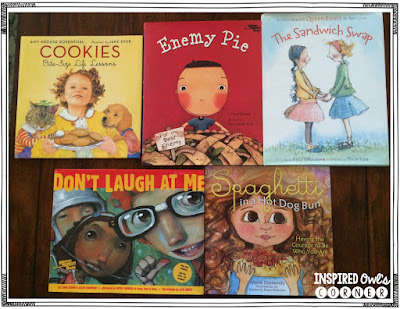 If you are doing Daily 5 or guided reading, it's easy to combine a community building lesson and a reading lesson into one with these beginning of the year books. At the end of the first day of school, I like to have my students get into sharing circle and share one positive thing that happened to them on the first day of school. It's a great way to end the day and send them home feeling happy about their new year. 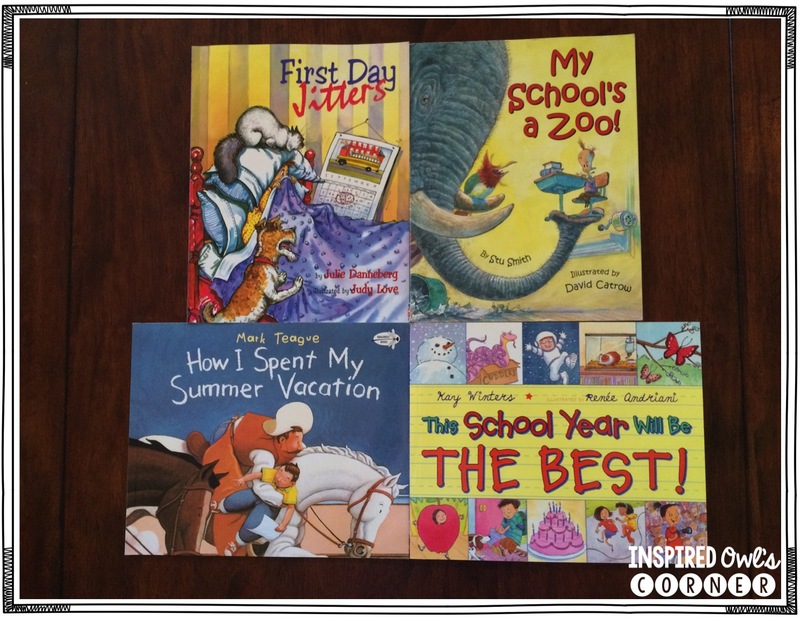 I hope I've given you a few new ideas to try out as you begin your new school year! 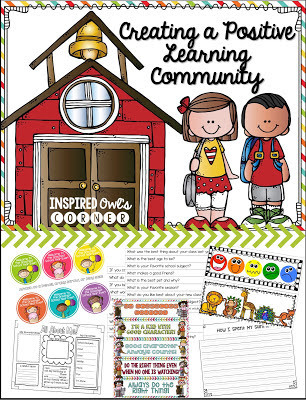 I have put together a freebie sampler from my Character Kiddos and Critters and Greatest School Year Ever back to school packs. 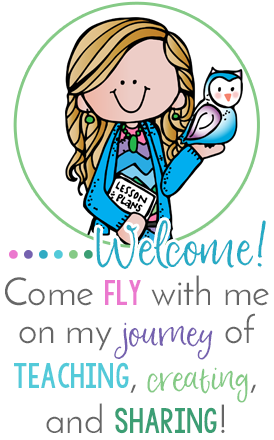 Just click on the picture below to download your freebie!